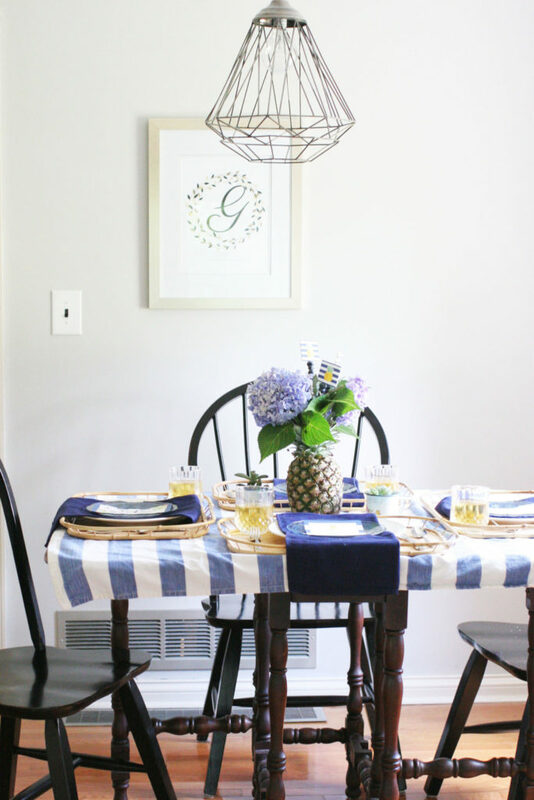 In this post: Host a pineapple party! Set a Pineapple Tablescape including a DIY Pineapple Centerpiece and a free Pineapple Menu template. It’s summer, and even though casual cookouts and BBQs are the standards, that doesn’t mean you can’t kick the elegance up a notch. Skip the burgers and dogs and curate a flavorful Hawaiian-themed menu, instead. 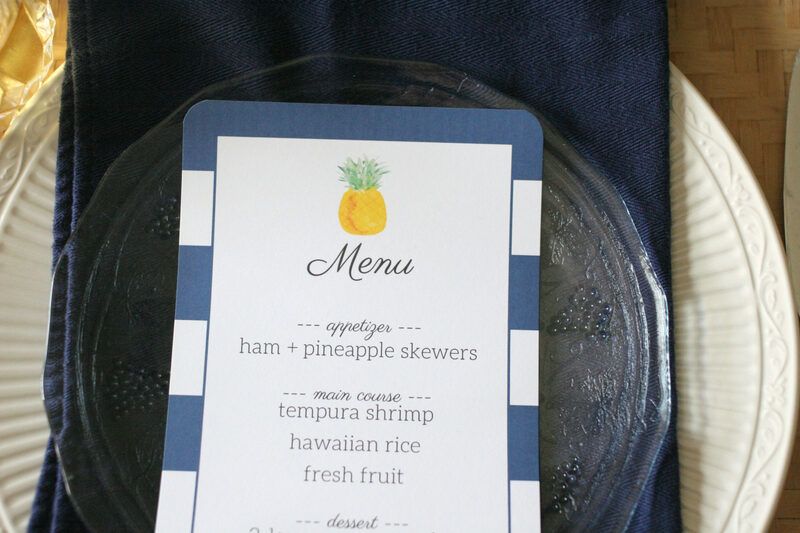 Then, have friends over for a chic dinner party, centered around an iconic tropical fruit — the pineapple. 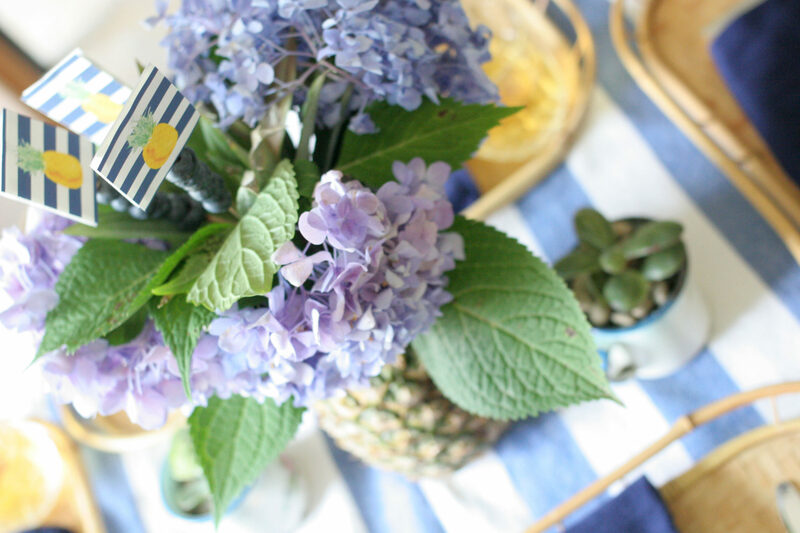 I’ve been crushing on pineapples as a party theme, ever since I shared an adorable Pineapple Birthday Party, last summer. 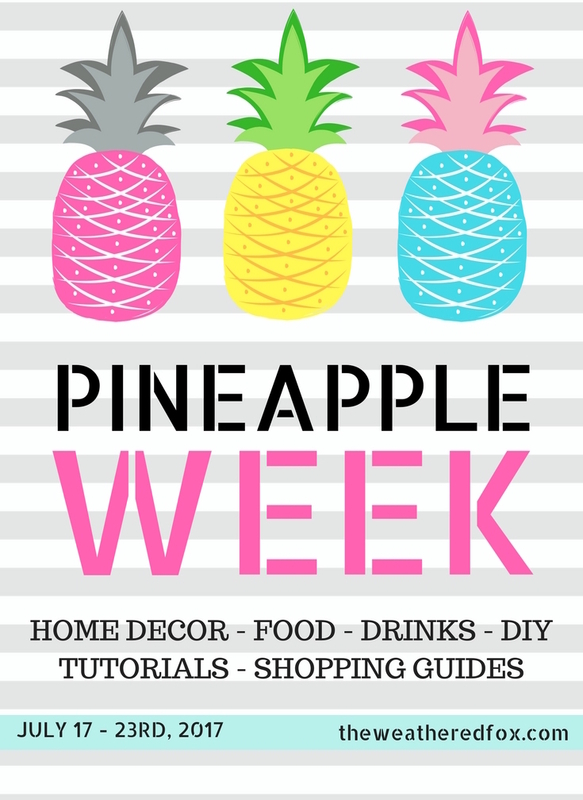 So, I was excited to participate in Pineapple Week, hosted by The Weathered Fox. In order to kick off this week-long event, 15+ bloggers are sharing craft, home, and party ideas on their respective sites. So, make sure to check out all the links at the end of the post! Cover the table with a casual, cotton, tablecloth. I chose a navy and white stripe table covering, that I found at a thrift store. 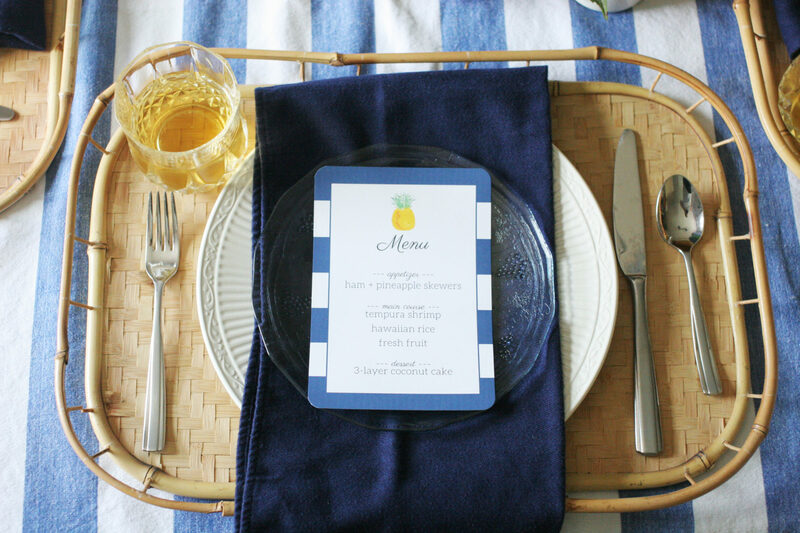 The stripe has a nautical vibe and isn’t the least bit stuffy — which makes it a fitting choice for a summer dinner party. 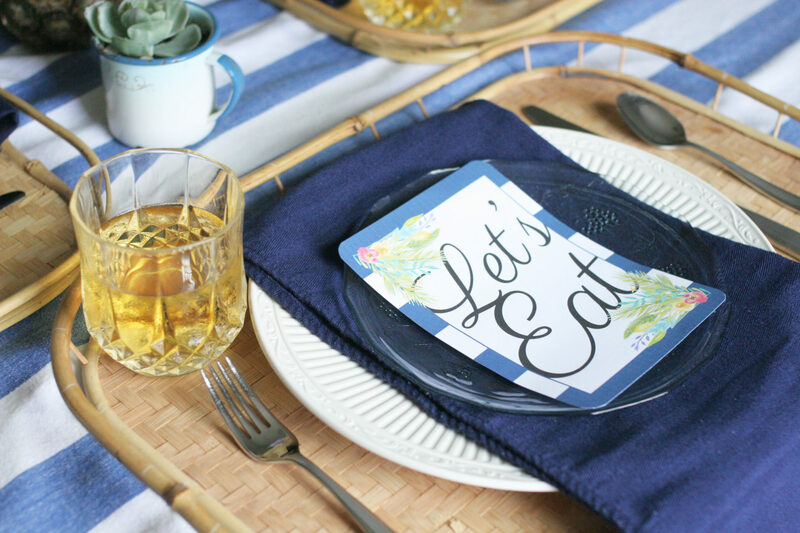 Next, layer in a placemat made from a natural material, such as bamboo or seagrass. These natural fibers hail from the tropics and pairing perfectly with a pineapple theme. Simple, white dishes complement nearly any tablescape, especially when paired with a decorative salad plate and colorful, cloth napkins. Even when much of the table setting is casual, I still like to choose delicate, crystal glassware. It’s a nod to elegance, that is understated and timeless. 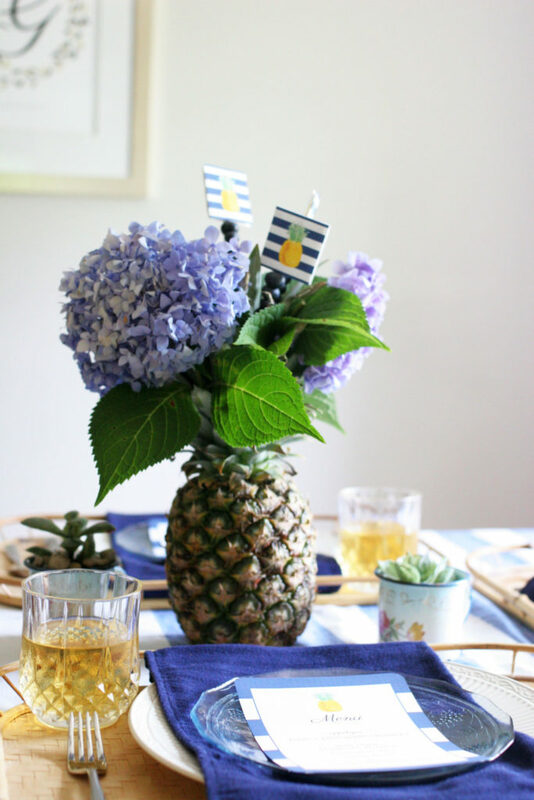 Of course, you’ll need to include a lovely pineapple centerpiece! 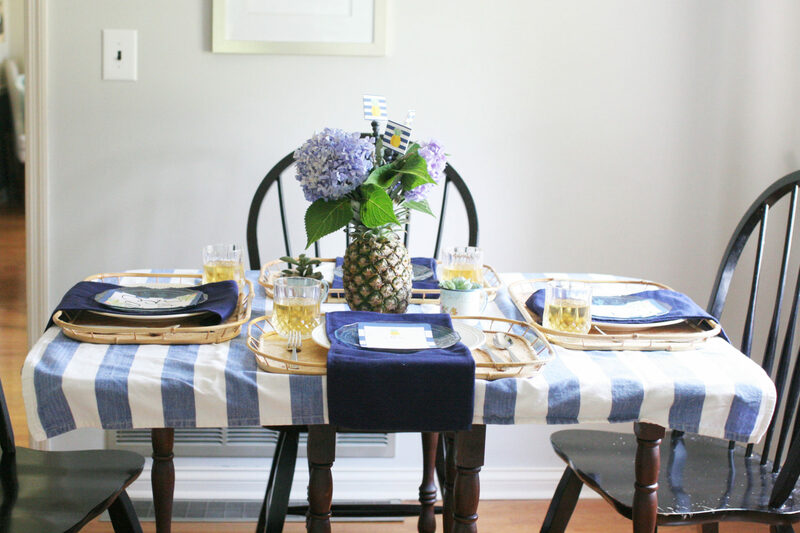 It’s just not a pineapple tablescape without one. The full DIY tutorial is posted at The Weathered Fox . 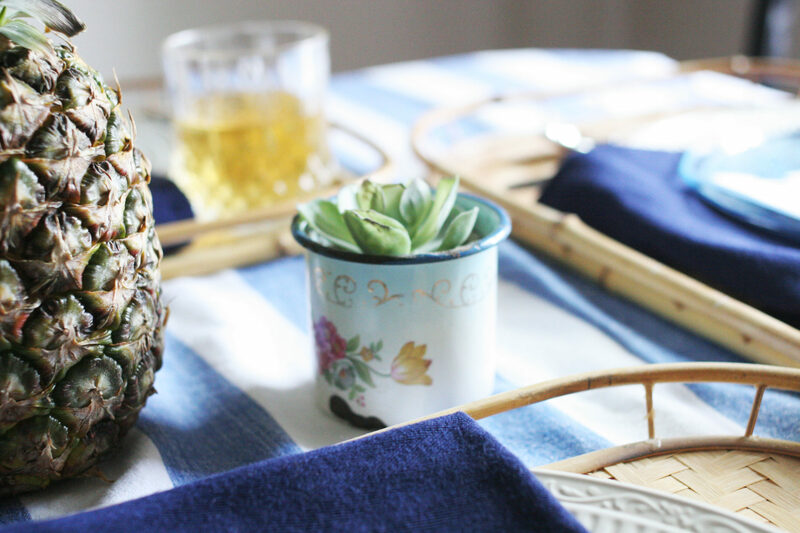 The final touch to a pretty pineapple tablescape? A coordinating menu that is both decorative and functional. You can grab a printable — and editable — version at the end of this post. In other words, you can fill in any menu items on the template. 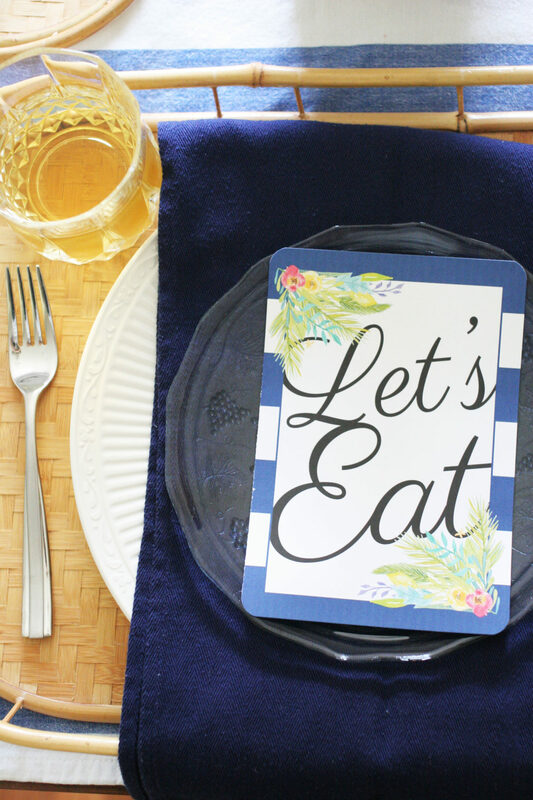 If you don’t want to create a menu, just print out 5×7 “Let’s Eat” cards to complete the tablescape. Round the corners of the card with a corner punch. Not hosting a pineapple party quite yet? Make sure to pin this post, so that you can grab the free printables when it’s time to entertain. The italics font is Parisienne and the serif font is Aleo Light. Files are for personal use only, not to be resold. I love the design Lora! It looks fresh, summery , with a fun pineapple twist! well isn’t this cute! I love a good centrepiece and this one is adorable. Well done! Pretty centerpiece and stripes are fun! Ha! Yes, it’s a sign 😉 Thanks for your sweet comments!